Frozen Shoulder? Let us thaw it out! 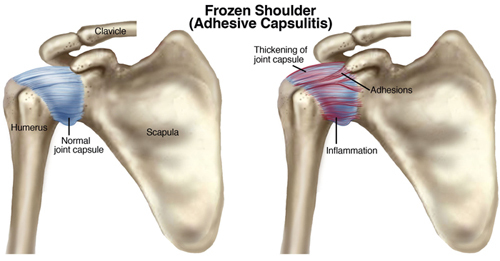 Adhesive capsulitis, or frozen shoulder, is a disorder that causes pain, stiffness and loss of range of motion, and primarily affects individuals between 40 and 60. If left untreated, adhesive capsulitis can go on to be an extremely debilitating condition for a long period of time, lasting an average of three years. To better understand the effect of physical therapy interventions on the condition, a large randomized control trial (RCT) was conducted. Results showed joint mobilization and exercise to be effective treatment options in reducing pain and improving mobility, while ultrasound, massage, iontophoresis and phonophoresis all reduced the likelihood of a favorable outcome. In this study, a sample of 2,370 patients with adhesive capsulitis underwent physical therapy for treatment. After each patient completed their PT sessions, the therapist recorded the specific interventions used for each subject Patients were also issued questionnaires to assess various aspects of their rehabilitation. A clinically significant improvement was defined as a 50% or higher increase in scores based on physical function and bodily pain, a number admittedly high by the study group but used nonetheless. Once evaluated, results showed that two intervention categories, “iontophoresis and phonophoresis” and “ultrasound and massage” actually reduced the odds of meaningful improvement in pain and function. Iontophoresis and phonophoresis are non-invasive procedures that use electric charges and ultrasound, respectively, to deliver medicine through the skin, and according to this study, may actually hinder recovery if used instead of other treatments. Analysis revealed that two other intervention categories, “joint mobilization/mobility” and “exercise” increased the odds of improvement in bodily function and hybrid function. These proven effective interventions are commonly used by physical therapists when treating adhesive capsulitis, either exclusively or in conjunction with medication and more invasive procedures. Though future RCTs are needed, this powerful cohort study clearly defines joint mobilization and exercise as effective treatments for adhesive capsulitis and recommends that passive modalities be excluded.